Since 1986, GSRREC scientists have studied reproductive performance, embryo transfer technology, forage utilization and nutritive efficiency, lactation physiology, and gastrointestinal parasitology in goats. Small ruminant scientists, producers, and individuals interested in goat production from all over the world visit GSRREC to learn about our research programs. Current programs include biological control of internal parasites, evaluation of basic roughages and dietary supplements for dairy and meat goats, development of year-round grazing systems, genetic-marker assisted selection for internal parasite control in sheep, invasive vegetation management with sheep and goats, breed characterization and genotype x environment interaction studies with meat goats and sheep, improving meat goat management methods, improving meat quality using pre- and post-slaughter methodologies, developing value-added meat and dairy products, and food safety. One of the most important findings in dairy technology research at FVSU is that goat milk cheeses can be frozen-stored and then can be marketed later during the off-season. The traditional belief is that goat cheeses cannot be frozen because of quality deterioration, but our research has proven that it can be done if parameters are tightly controlled. This finding is very important because the seasonality of goat milk production has limited dairy goat farmers’ ability to produce a year-round supply of goat products, which is needed for consistent marketing and the survival and profitability of their businesses. This can help sustain the struggling dairy goat industry, as well as food scientists and processors, and consumers. Future dairy technology research will focus on developing goat milk infant formulas, which will be important not only for patients and infants allergic to cow milk, but also for continued development of a sustainable and profitable dairy goat industry. A state-of-the-art meat technology facility was built on the FVSU campus in 1998 to assist in animal science undergraduate and graduate instruction, to establish and maintain an internationally recognized chevon (goat meat) technology research program, and to provide service to the community. Students enrolled in meat science and product technology courses receive hands-on training on preharvest handing of animals, stunning, slaughter, fabrication, meat quality assessment, and product development procedures. Students also learn the principles of food safety. Current meat research projects focus on evaluating pre- and post-slaughter methodologies that improve chevon quality and food safety. A major thrust is on the development of value-added products using chevon to improve public perception and expand the existing market for goat meat. 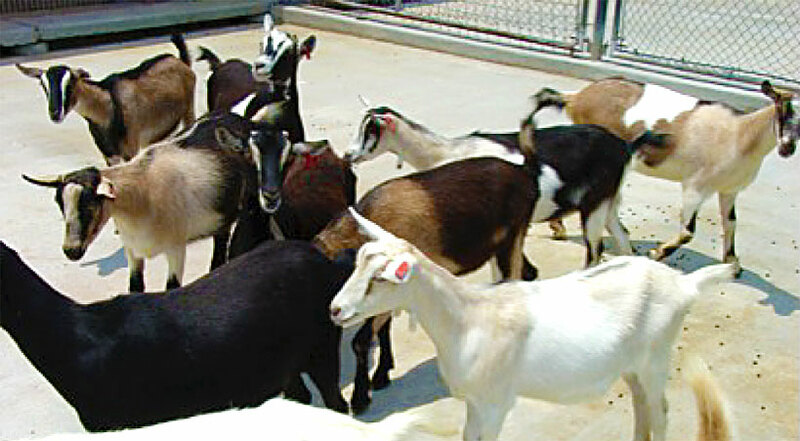 The chevon technology program at GSRREC is now regarded as one of the leading goat meat research programs in the nation. FVSU is the lead institution for the American Consortium for Small Ruminant Parasite Control (ACSRPC), an international research group dedicated to finding non-chemical methods of controlling gastrointestinal nematodes in sheep and goats. Parasitology research at GSRREC and the 25 other institutions of the ACSRPC have greatly impacted small ruminant producers in the US and overseas by reducing dependence on expensive, ineffective anthelmintic drugs. In addition to research, the Center’s ongoing demonstrations, seminars and workshops provide producers and county agents across the country with the latest information on goats and other small ruminants, while its expanding library features slide and video presentations and numerous books, journals and articles. The facility’s popular GSRREC Newsletter reaches over 3,000 people in the Americas, the Caribbean Basin, Europe and Asia. Outreach activities at the Meat Technology Center include providing custom slaughter services to farmers in the community, training very small producers and processors on food safety principles, and advising goat producers on pre-harvest management and post-harvest methodologies to improve chevon quality, marketability, and food safety. The Center features a main building with offices and conference room, milking parlor with Grade-A creamery, photoperiod rooms, four barns, loafing pens, kid nursery, surgical suite, grazing pastures, feed mill, storage facilities, and laboratories. The Meat Technology facility has a state-of-the-art sensory laboratory in addition to food science and chemistry laboratories. The laboratories are equipped with near-infrared reflectance spectroscopy (NIRS), high performance liquid chromatography (HPLC), texture analysis, and gas chromatography-mass spectrometry (GC-MS) units, a VarioMax mineral analyzer, and spectrophotometer, among others. Additional laboratories are in the Stallworth Research Complex, including muscle biochemistry, reproductive physiology and cell biology, nutrition and lactation physiology, parasitology, and forage quality laboratories, as well as a computer laboratory. Currently, Center personnel maintain a goat herd of 400 animals, mainly Alpine, Saanen, Spanish, Boer, and Kiko breeds. Breeding bucks and does are used for both dairy and meat production research and management demonstrations, including performance evaluations designed to provide breeders with information on genetic potentials. The Center also houses flocks of sheep as a part of a project to improve production systems.